With tomorrow being the first of the month and all, we wanted to point out the the S&P has been up over 1% on December 1st for the last 3 years. While the press has been busy speculating on what the next major private equity deal will be, oil stocks have been quietly staging a rally. Even more impressive is the fact that oil the commodity has not been nearly as strong, as it is still over $14 off its Summer highs. 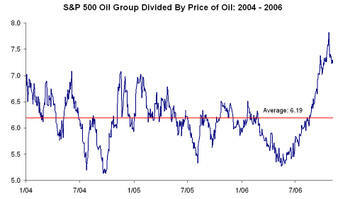 In the chart below, we plotted the ratio of the S&P 500 oil and gas group to the price of oil. As the chart shows, the ratio currently stands at 7.25, which is near three year highs. This compares to a three year average ratio of 6.19. In order for this ratio to get back to equilibrium (and no one says it has to), one or a combination of two things has to happen. Either the stocks have to trade down or the commodity has to rally. Based on current prices, oil would have to rally to $73 (17%) or the stocks would have to correct by 14%. Another possibility is that both assets continue to rise, but the commodity rises at a faster pace than the stocks. S&P/Case-Shiller recently released their September home price data. 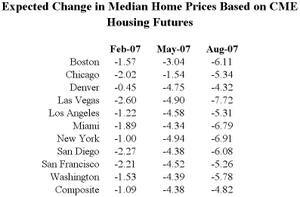 Since the CME now trades futures based on the S&P/Case-Shiller home price indices, we looked to see what the February, May and August 2007 futures are forecasting. The table below shows the expected percent change in single family home prices in the ten cities that Case-Shiller tracks as well as a composite for the entire country. The change is calculated from the most recent September actual data (the data lags two months) to the 2007 months when the futures contracts expire. 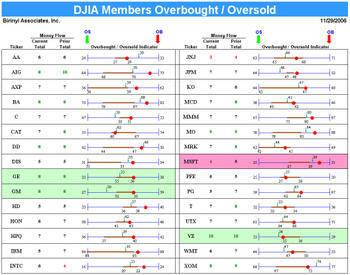 Below is our overbought/oversold program run on the Dow 30 members. We also include the Birinyi money flow scores (that you can learn more about at www.birinyi.com). The general way we use this file is to look for stocks that have positive money flow scores that are oversold or negative money flow scores that are overbought. We code over 1500 stocks each week based on money flows and give them a score from one to ten. Stocks that score eight or better are "buys" based on money flows while stocks that score four or less are "sells". So below we see that GE, GM, and VZ are all trading at or below the bottom of their trading range and have a money flow "buy" rating. These are stocks where we believe the risk/reward favors the reward side at the moment. On the other hand, MSFT is overbought and has a money flow "sell" rating. We run this program every morning on the S&P 500 and the Mid Cap 400 as well as the largest US and Global ETFs, and it is part of our Mini Institutional Service for those interested. Posting will be slow for the next two days as we work on our monthly Reminiscences Newsletter that goes out tomorrow evening. You can sign up for the service securely and easily on the top left column of this page. Be sure to watch Birinyi analyst and Ticker Sense's own Paul Hickey on CNBC's Street Signs this afternoon at 2:10 PM ET. He'll be discussing retail stocks and sector performance. Below we rank how the Dow stocks and the ten major sectors performed yesterday. PFE was the best performing stock on the Dow while GM was the worst. 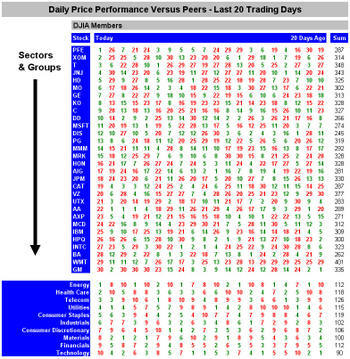 Energy led the sectors while technology was the worst performer. We also show the performance each day for the last twenty days so you can gauge what has been leading or lagging. With the steep market decline yesterday, there are no S&P 500 stocks that have been up 5 or more days in a row. On the downside however, there are plenty. 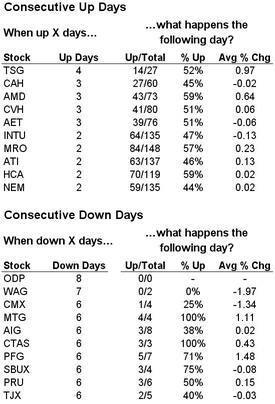 Office Depot (ODP) and Walgreen (WAG) are leading the pack, down 8 days and 7 days respectively. Citigroup (C) and Bank of America (BAC): Takeover Targets? An article in this morning’s Chicago Tribune illustrates how on Wall Street what looks good on paper and on spreadsheets, often doesn’t translate into the real world. The article quotes a research report put out by a major sell-side firm which highlighted several companies who are currently so cheap that they could become takeover targets. The list of names included Bank of America (BAC) and Citigroup (C). We certainly agree that an argument can be made that each of these companies are cheap on a valuation basis. However, who can actually take over these companies? Citigroup and Bank of America are the fourth and fifth largest companies in the country, and rank in the top ten in the world! So unless Exxon Mobil, GE, Microsoft, or Russia’s Gazprom are looking to diversify into the banking sector, we wouldn’t be buying these stocks in hopes that they get bought out. 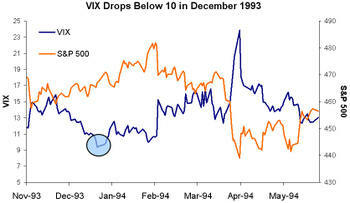 The VIX (S&P Volatility Index) closed below 10 yesterday and the day before. This is the first time it has happened since the end of December 1993. 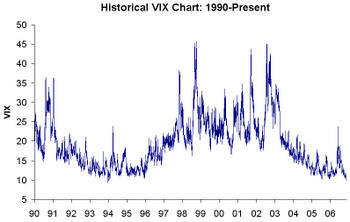 While the VIX remained low for a couple more years after dropping below 10 in 1993, volatility did pick up in the months after and the market struggled.